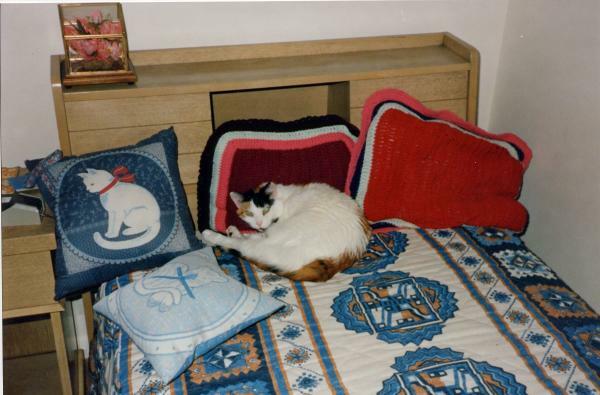 Here are more photos of my former cat Cheryl II. Click on a thumbnail image to see a larger version. Cheryl II lying on the heating vent. In the winter Cheryl II would find a heating vent and cover it complete, soaking up as much warmth as possible. Cheryl II on my desk next to my computer. 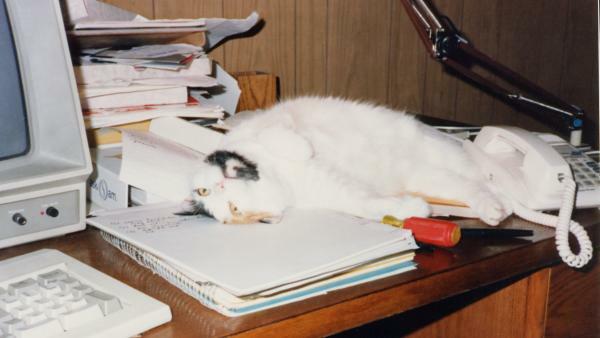 Cheryl II loved to stretch out over any computer papers I was was working with. Cheryl II spent most of her time sleeping, as most cats do. 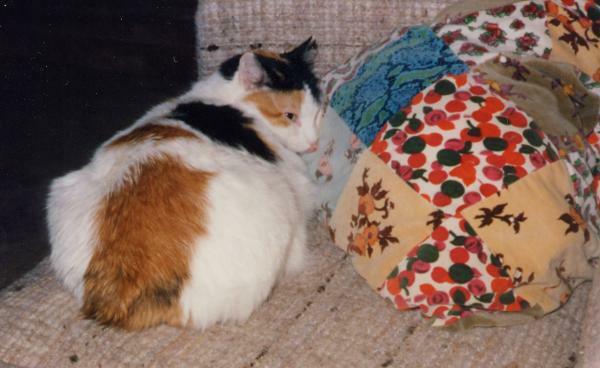 She was very fond of pillows and always tried to sleep with her head lying on one, or alternatively, on the corner of of a piece of furniture. Best of all was to have both, as in this photo. Cheryl II loved to play with toys. 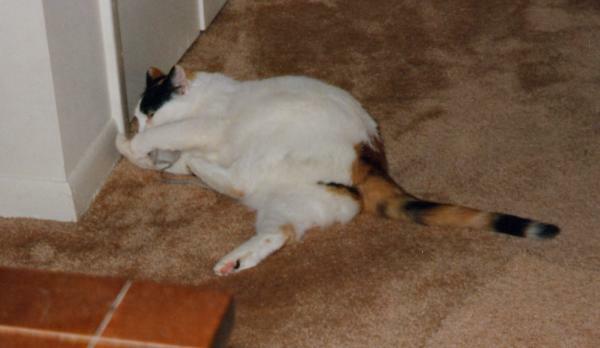 Here she is batting around a toy mouse. She always managed to swat her toys underneath some piece of furniture where she couldn't reach. I still find some of her toys from time to time as I rearrange furniture. 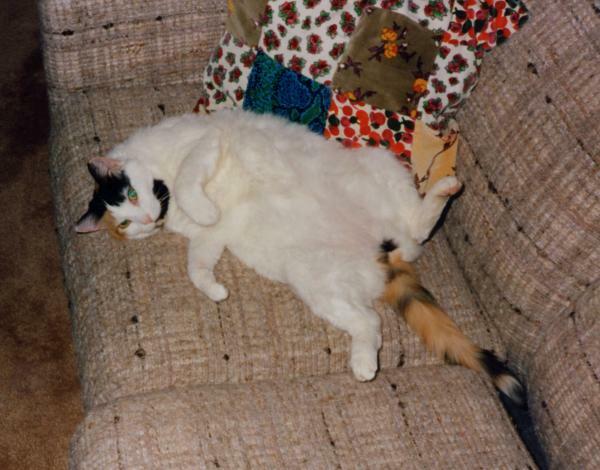 Cheryl II loved to have her tummy rubbed. When she wanted a tummy tub she rolled over onto her back and looked expectantly. If the tummy rub was not forthcoming, she'd scrunch over closer and gently start pawing my hand until I started petting her. 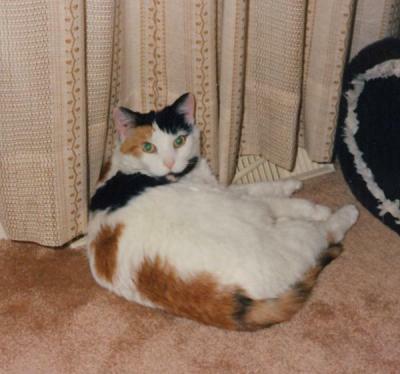 Since Cheryl II was declawed I never let her go outdoors, and luckily she never wanted to go outdoors. 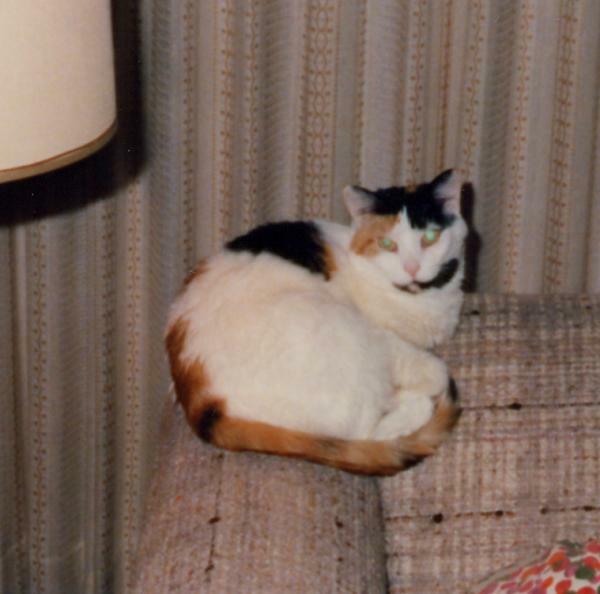 She did enjoy sitting on the couch or a window sill so she could watch the activities of the animals and people outside. Here she is gazing through the bottom of the window shade. Cheryl II typically sat with her paws straight out in front of her in Sphinx-like fashion. 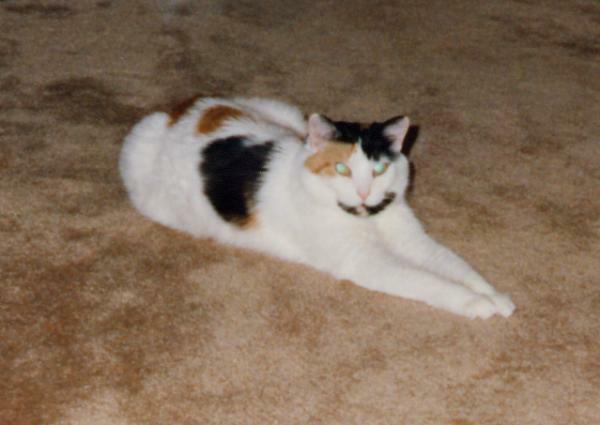 My previous cat Grosse Mère rarely sat like a Sphinx. Instead she sat with her front paws tucked in under her. Cheryl II usually slept with me, but she frequently slept in the guest bed when I was at work. As usual she tried to find a spot propped up against a pillow. 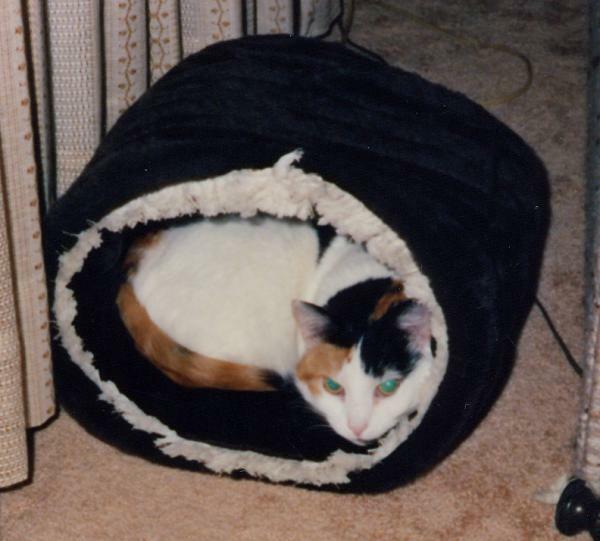 Cheryl II loved to sleep curled up in a tubular cat cave. She slept there for ages until one day she decided she didn't like it anymore, and never used it again. One day I opened my Macintosh carrying case in preparation for taking the Mac someplace. Cheryl II immediately decided the case was her new cat cave and promptly took a nap there. Cheryl II had a penchant for sitting in what one might call a precarious position. 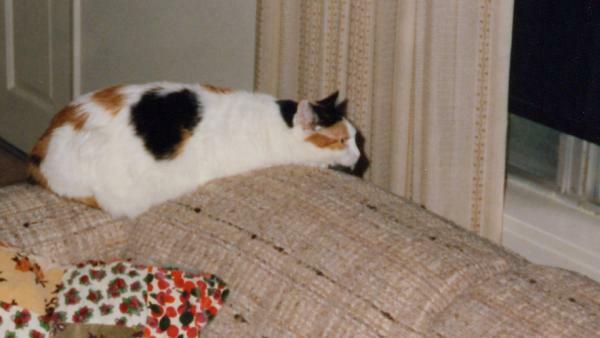 Here she perches on the edge of the couch. This was one of her favorite positions since it put her right in full view of anyone entering at the front door. She was always hoping for a pet from anyone who walked in. Back to my cats page.